Then there are also normal annually issued products like an uncirculated set of America the Beautiful Quarters and a coin cover with Presidential $1 Coins. U.S. Mint product prices and release dates are subject to change. Collector products launch at Noon (ET) on the day of their release. Orders may be placed through the U.S. Mint website at www.usmint.gov or by phone at 1-800-USA-MINT (872-6468). All ten America the Beautiful Quarters are attached to a folder that offers information about the quarters and the national parks they honor. Florence Harding First Spouse Gold Coins are the first of four in the series for 2014. Available in proof and uncirculated qualities, obverses bear a portrait of Florence, wife of the 29th U.S. President, Warren G. Harding. "Mrs. Harding championed the cause of World War I veterans, symbolized by the initials WWV that form a torch, transformed into a pen at its base to represent her extensive correspondence with veterans, their spouses, and widows. The camera represents her orchestration of photo opportunities supporting her husband’s campaign. The ballot box represents her distinction as the first First Lady to cast a vote for a presidential candidate, her husband." Limited to 10,000 across both production options, debut prices will be set one day before they are released (July 9, 2014). 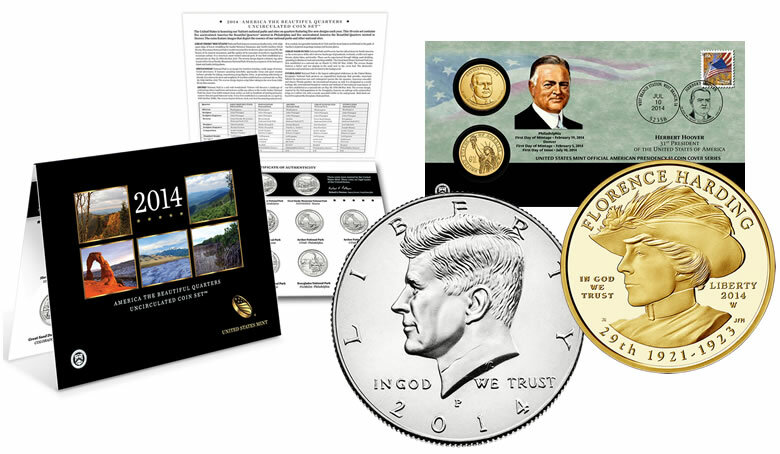 The Herbert Hoover $1 Coin Cover is the third in 2014 and the 31st overall in the U.S. Mint’s American Presidency $1 Coin Cover Series. Held within a display card are two Hoover dollars pulled from U.S. Mint plants on the first day they were produced. These coins can be viewed from both sides of the card which has an image of the president on the front and information about him and the coins on the back. Grace Coolidge First Spouse Gold Coins are the second set of four in the series for this year, and are also available in collector qualities of proof and uncirculated. Obverses bear a portrait of Grace, wife of the 30th President of the United States, Calvin Coolidge. Reverses depict three hands finger-spelling the letters USA in American Sign Language. The White House appears in the background. The image is symbolic of Mrs. Coolidge’s advocacy for the death and hearing impaired. These gold coins have the same 10,000 mintage limit with opening prices set on July 16, 2014. The 50th Anniversary Kennedy Half-Dollar Uncirculated Coin Set is one of three Kennedy half-dollar anniversary products that celebrate the semicentennial of the coin’s debut in 1964. Inside the set are two uncirculated Kennedy half-dollars with one produced at the Philadelphia Mint and the other struck at the Denver Mint. Obverses offer a higher relief than standard issues of today where reverses are the same. Priced at $9.95, the set is expected to sell well given its uniqueness. In related coin news, on August (the 5th) the U.S. Mint will release a special anniversary Kennedy gold coin that has a dual-date 1964-2014. It will be struck in 24-karat gold to about three-quarters ounce. Also and at a yet unannounced date, the Mint will offer a four-coin Kennedy set with each of the halves in 90 percent silver and from four different minting facilities. Bringing up the end of the month is the 2014 National Baseball Hall of Fame Young Collectors Set at a yet undermined price. The set includes a clad 2014-D Uncirculated National Baseball Hall of Fame Half-Dollar that is held inside a special folder with information about the National Baseball Hall of Fame. Designed for youngsters, the tri-fold folder features "United States Mint Kids" characters as they journey into the history of the organization. For more, read this earlier Coin News Extra article about the Baseball Young Collectors Set.